"Afterward Brzezinski was asked if he had woken his wife. “No,” he said, “if she was going to die, better it was in her sleep.”"
In a maudlin sort of way there is a funny story that Zbigniew Brzezinski sometimes told. It was when he was national security advisor to President Jimmy Carter. It was his job to take any calls from the military on a suspected incoming nuclear attack. In a matter of seconds he had to evaluate it and decide whether to tell the president, even if he was asleep. He was close to Carter and mostly they worked together in harmony. They fashioned and negotiated the Israel-Egypt peace treaty, which led among other things to the Israeli withdrawal from the Sinai. They engineered a handover of the American-owned Panama Canal, a very sore point in Latin America, to the Panamanians. They pursued with the Russians a new concept known as Strategic Arms Reductions of nuclear weapons to replace the old Strategic Arms Limitations. The Russians at first did not like the idea, but in the end agreed to it. Together they made some big mistakes. One, after the Iranian revolution, was admitting the deposed Shah to the U.S., which triggered the bitter animosity that has lasted until this day. Another was the role played in undermining the Soviet invasion of Afghanistan. The Soviets had intervened and installed a puppet president, Babrak Karmal. Brzezinski persuaded Carter to send billions of dollars of military aid via the CIA, the Saudi Arabian and Pakistan intelligence services to Islamic militants fighting the Soviets. After their success in pushing the Red Army out, the mujahidin evolved into the Taliban which later gave refuge and a base to Al-Qaeda. That in turn led to 9/11 and the NATO-supported civil war that continues, America’s longest war ever. After he left office he continued to be one of the principal influences on American foreign policy. President Ronald Reagan even thought of him becoming his national security advisor. For a while he became a foreign policy mentor to Barack Obama. It does not reflect well on Obama that after a while he pushed him to one side when it became clear that Brzezinski had strong critical views, which he made public, of Israeli policy toward the Palestinians. In truth he was never right nor left. He was not to be pigeon-holed. He strongly believed in social justice and the emancipation of black people at home and abroad. He was a vigorous (if not consistent) proponent of human rights. He opposed both wars against Saddam Hussein’s Iraq, warning of the likely consequences of a war-torn country and its destabilizing impact on the Middle East. 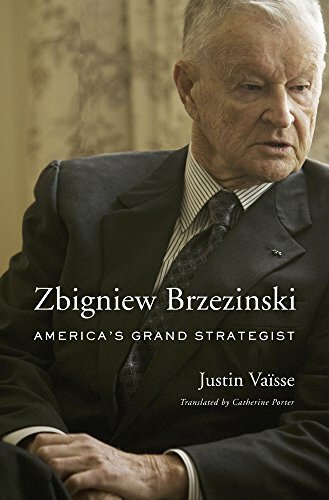 In this new book—only the second to have been published on the man—you get much of the story of the life of Brzezinski that we have no space for here. But what you don’t get is a rounded, seen-from-all-sides, view of the most important issue he ever dealt with: the arming of the mujahidin in Afghanistan. Nor do we get a fair and detailed rendering of his view that getting Russia to stay close to the West, even entangled with it, was a missed opportunity. One can imagine if President Carter had been in power at that crucial time with Brzezinski at his side the awful and self-destructive relationship that the U.S. and much of West has today with Moscow would not only have been avoided but would have been replaced with a deeply cooperative relationship. Nevertheless, it is an important and well-written book. It has been deeply researched, if not, in a couple of important cases, always right. But if you want to begin to get to know this brilliant man this is a book to read. Hopefully in due course there will be others that straighten out those few bad mistakes in the author’s judgement.